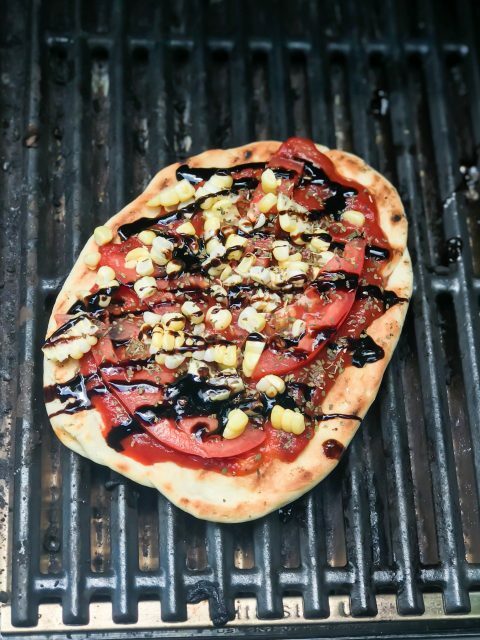 I love grilling pizza because gives it a nice wood-fired taste. If you recall, I posted a Grilled Pizza recipe back in 2012 and this is basically just a variation on that post. While the instructions I gave in that post definitely still work, I’ve updated this post to include (what I think) is an easier way – transferring the dough from parchment paper vs a cookie sheet. The main reason I’m even blogging this pizza though is because the flavor combination is on point!! I’ve had to cut out dairy for a while and since I didn’t have any vegan cheese on hand I got creative with my toppings. I scrounged around in my fridge and came up with this combo. It sounds weird, but trust me it is SO GOOD!! Give it a try. Enjoy! 1. For the dough: Dissolve yeast in warm water. In bowl of stand mixer with dough hook, combine yeast mixture and oil. Add flour and salt. Mix on low speed until mixture forms a ball. Continue to mix 3-5 minutes more until dough is smooth and elastic. Adding additional water or flour (~1 tbsp at a time) if needed. Place dough in a greased bowl and cover with plastic wrap. Let rise until doubled, about 1 to 1-1/2 hours (depending on the temperature). Punch dough down and let rest 10 minutes. 2. When dough is ready, preheat your grill on medium high heat (if using gas, if using charcoal just build your fire!). 3. Divide your dough into 3-4 pieces. Press each piece into a thin circle on a piece of parchment paper. 4. Place one portion of dough onto hot grill – leave the dough on the parchment paper. The dough should stay attached the parchment paper and then you can peel the parchment paper off once you have it on the hot grill. You could also just peel the dough off the parchment paper and place it on the hot grill – I find leaving it on the parchment paper easier though but to each their own! 5. Close the grill and let the dough cook until you have nice grill marks and the dough easily releases from the grates. Flip dough. 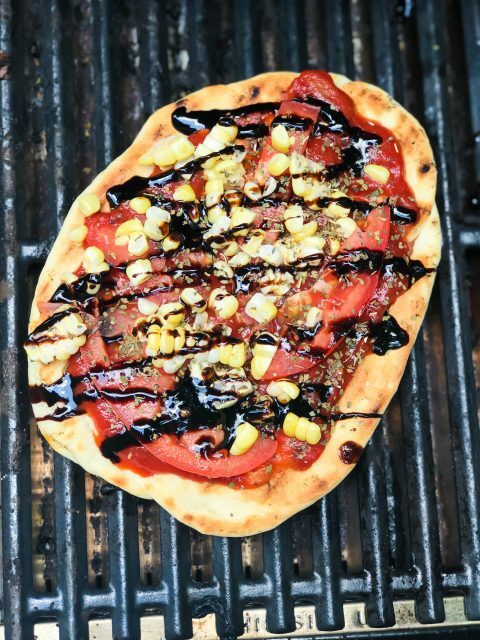 Top with a thin layer of marinara sauce, fresh corn, sliced tomato, a sprinkle of fresh (or dried) basil, and a drizzle of balsamic glaze. If you have two burners, turn off one burner and slide to indirect heat. Let cook another 1-2 minutes or until bottom is browned. Repeat with remaining dough.